Talking Point: What Do You Think of 3DS XL? 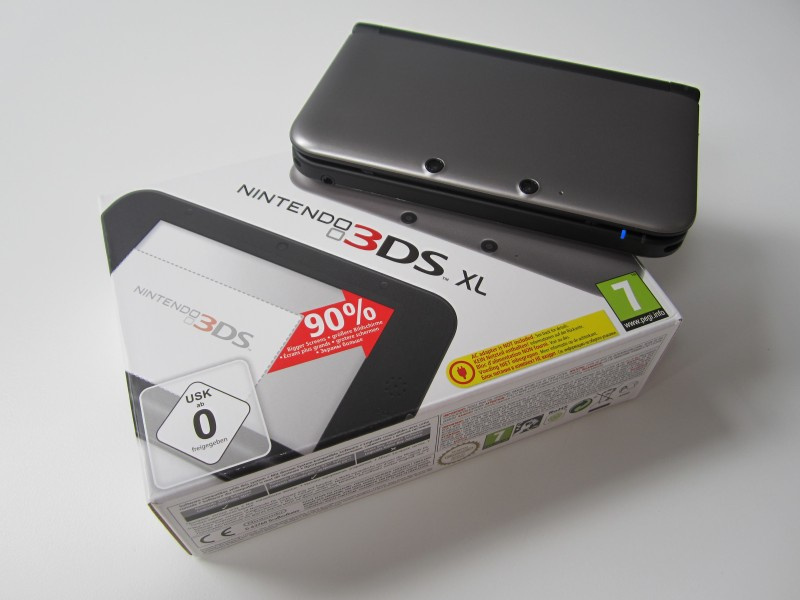 3DS XL landed on European and Japanese shelves over the weekend. It seems to have had a good start; in the UK it outsold the original 3DS model at a rate of around 2:1 and bumped up the software sales of Mario Kart 7, Super Mario 3D Land and Mario & Sonic at the London 2012 Olympic Games — though we're not sure about giving the XL any particular credit for the last one. Meanwhile over in the East, undoubtedly helped by the release of New Super Mario Bros. 2, 3DS XL — or LL, as it's known in Japan — sold over 193,000 units in the first two days on sale. We imagine Nintendo's quite happy with the results — but more importantly, are you happy with the system itself? Have you purchased or tested one out, and if so what do you think? We've already reviewed the 3DS XL hardware, but here are some more personal opinions about the new model from a couple of Nintendo Life staff members. I'd known from a couple of brief hands-on opportunities that I liked the form factor of 3DS XL, but I was particularly buzzed to get my own red + black model home on Saturday. Despite its plastic build, it actually feels like a quality piece of kit to me, but this overall feel seems to be polarizing opinion. Since successfully transferring my profile and games, meanwhile, I've been noticing a big difference in the gaming experience. The screens and system as a whole really are a lovely size, the extra weight seems well balanced enough that I haven't found myself struggling in longer play sessions, and I prefer the touch of the D-Pad and buttons over the original model. Marvel Pinball 3D has been a favourite, as I can actually see what I'm doing, and big titles such as Super Mario 3D Land really pop and look gorgeous. Those who obsess over pixel density and resolution may look closely and spot flaws on the bigger screens, but my over-arching impression has been overwhelmingly positive. Then there's the battery, which has been a very, very welcome improvement. Overall, I'm pleased that I took the plunge. I was pretty excited about 3DS XL prior to launch, as I was a great fan of the super-sized form factor of DSi XL. I always found the original 3DS to be a bit tiny and cramped after using DSi XL as my main handheld for so long, and I was never a fan of the D-Pad either. 3DS XL addresses both of those concerns for me: it feels extremely comfortable, and every button has just the right amount of click to it. The larger display gives off a 3D effect that is easier on the eye too, though I think a slight resolution bump could have been beneficial; it looks great overall, but some apps, such as StreetPass Plaza, look a tad rougher than on the original model. I dragged out all my 3DS games to test, and the huge screens really give everything a new lease of life – particularly titles like Super Mario 3D Land. I've also spent a fair amount of time on Pokémon Conquest, and in 1:1 mode I'd say that DS games have rarely looked better than on 3DS XL. This is how you do a hardware revision: it doesn't cut off the rest of the user base, but it does offer a superb alternative to the original model. I have no regrets. Have you bought or played with a 3DS XL yet? How do you feel it compares to the original 3DS model? We'd love to hear your opinions on the positives — or negatives — of the new system and your initial impressions. Join the discussion in the comments section below. If you've picked up a 3DS XL and need to know how to transfer your 3DS data, check out the following video. If I get a freebie, I'll take it. If not, I'm passing. Love my purple 3DS just fine. It's a disappointment. Nothing was upgraded except screen size and battery (yaaay, an hour longer I have to play Bird Mania 3D). I got the blue one and i'm really impressed by it. Bigger is definitely better in this case. Much nicer than my Aqua Blue 3DS. Kingdom Hearts alone deserves a bigger screen. i know this is not the right place to ask this but when i transfer to my 3ds xl from my 3ds, does this make my ambassador games go away and all save data to all the various games including the ambassador games go away too? Wasn't that bothered unitl I tried one out. The larger screen is gorgeous and really makes the 3D stand out. Also a lot more comfortable to hold. Condidering getting one now. I got mine on Friday and I have to say, it's awesome! It feels more comfortable in my hands, the top screen has less reflection, the matt finish looks really nice with no nasty fingerprints, the upscale looks good and the system transfer basically turned the XL into a carbon copy of my original 3DS. Overall, I'm very pleased with the 3DS XL. Looking forward to picking mine up here in the states, in a few weeks. Sir, you are a BirdManiac! Enough already, I'm sold. On the 3DS XL however, I am not sold yet. I'll wait for an excuse (like my original taking a poop.) Seems great though. lucky, here we are waiting in the states. I would trade mine in if they allowed system transfer at Gameslop but it looks like I'll have to buy and sell on Craigslist later so I don't lose all my junk. This is a great idea since it really did feel to small for a lot of games especially considering the horrible glare and cramped d-pad slider buttons. I love it to bits. It is far more comfortable to hold and play, the buttons feel much better and the bigger screens are more immersive and i can actually see whats going on. Ive rediscovered some older releases like Starfox 64 that are now far more playable and enjoyable. Recommended purchase! I bought the original 3DS on launch day and right now I have the Red and Black 3DS XL reserved at Gamestop. August 19th can't come sooner. I can't truthfully judge it yet without having it in my possession, but it certainly seems to me that bigger is better. Less portable AND more expensive? Count me in! For me, I like the original 3DS size as I can take it everywhere with ease. I also like the look and design of the original better. The 3DS XL however does have much better battery life which I wish my original 3DS had. @irken004 Agreed. I honestly think a lot of the hate will be unfounded from people who haven't even tried it. I'll wait for an actual 3DS update...you know, like how DSi was. I'm thinking about picking a silver one up tomorrow. Looks great, huge improvement over the original model. I don't have the money for it now, but when I do, I'll look into it. I may just wait and see if my normal 3DS holds out over the years. The XL isn't technically superior in any way, and my normal 3DS can play the same games unhindered. You wont loose it. The transfer will keep all your games but your save data as well. Im totally buying this one Colors 3d would look awesome on it! I am just fine with my small little 3DS that fits in my pocket, after feeling burned out after buying the Classic when it first came I vowed to never upgrade unless it was like the DSi, so I can wait another 3 years if I have to. The 3DSXL isn't that much bigger then the regular one closed. Still fits in your pocket. (well not if you have small pockets which then not even the regular 3DS fits). I'll consider upgrading when I can get a really good upgrade deal. $100 for bigger screens doesn't make sense to me since I can see fine on my normal one. @NImH37 It was my convincing SwapNote, right? @irken004 I hate it, and you know why? 'Cause it isn't here in the states yet. Other than that, I'm fine with my current black 3DS; no problems really except the glare when outside. My poor eyes and arthritic right hand cannot wait for this baby. Trying hard to be patient and not green with envy at my brit friends. Hey…'envy green' would be a great launch colour here in the states! Got it today, upgrading from kosmo black 3DS, I have to say after the very first time in held it in hand all my concerns were blown away. Build quality looks cheap on photos but definitely isnt in real, it feels great, solidly built, comfortably heavier than the small 3DS and the blown up screen with same resolution hardly gives you any trouble. I could see jaggies in Mario Kart and Heroes of Ruin before, I can see them now as well, they don't distract me more than they did before and everything else looks just fine. Definitely recommended! Actually, I just flew over to New York for vacation, and I stopped by the Nintendo World store. An employee actually had a 3DS XL demo unit, and I got to try it out! The buttons still felt pretty small for my big hands, but everything else felt pretty good. The bigger screen makes the 3D stand out more to me, probably because it makes it look more... shall we say, cinematic. I want one, but I'm waiting until it comes in solid black. No regrets about buying a 3DS last year though (the day after the price drop). I imagine more colors will come out sometime in the second quarter next year. @bezerker99 You say that as though a larger screen is not a big deal... in a VIDEO game. I think iit looks great. I can't explain why I would spend more on a 2nd 3DS, as opposed to one of the consoles I don't have, but I'm really, really tempted. I think it doesn't have a Circle Pad Pro built in so I'm not paying for it. Nintendo made the Circle Pad Pro available then has seemingly worked to discourage the distribution of and use of the Circle Pad Pro by making it online from GameStop only. This is despite the universal complaint about the PSP was the lack of the 2nd Analog Stick and how the PSP 2 has the 2nd Analog Stick. Nintendo is being incredibly stupid by insisting their system is better off without efficient camera controls and is good enough to poor substitutes. In the end it just means 3D games can never be too action packed or the lack of good camera controls would make the game unplayable. @Hyperstar96 I carry a messenger bag to hold all of my gadgetry. The 3DS XL is no less portable for me! Plus, the price difference is negligible with such an impressive screen size. It's a day 1 purchase for me. I kinda wanted this. Should have actually waited to buy this. I like the normal 3DS, but since I hardly take any portable system with me (my smartphone replaced them ), I think this one would fit me better. I've been away this weekend, but I'll be picking mine up at the post-office tomorrow. I ordered a red one, and I'm quite sure I'll like it. My boyfriend will get my cosmos black 3DS after I've finished a system update, so I'll finally have someone else that owns a 3DS (he really didn't feel like upgrading from DS but now he get's an upgrade for free so hopefully he will like it)! EDIT: Have completed system transfer and everything now and I'm very happy with my new 3DS XL red, feels super in my hands. Kinda lame that no game stores where I live have screen protectors for it yet though. Stickin' with the Zelda 3DS Until Limited Edition comes out. @Heatran5400 from what I've read on Nintendo's site, you can transfer the Ambassador games up to three times.But I'm unclear about the game saves (on any game besides those using cards). I have heard both that the saves ARE and ARE not transferred, I'm not sure there. I'll pass and wait for the next revision. It would be nice if they gave out more of a color choice from the start. Limited Editions are one thing, but freeing up some peoples' favorite colors after they already have one just isn't nice, haha. Like if I decide to get an XL early on and they come out with orange later. I am really tempted to pick up a 3DS XL after hearing all the positive feedback. I am going to have a tough time holding out until Black Friday because I am hoping that Nintendo makes a special edition of the XL. Matte finish, bigger screens and the shoulder buttons have made me want it. Can't wait to play games like DoA, SF643D and OoT3D on the XL. It doesn't come with a second circle pad but I can get over that. Still the 3DS XL makes the production of a normal 3DS look pointless. Plus I can't sneak a 3DS XL into school. Still waiting until I can see the 3D in action before I commit to a purchase. I anticipate that the larger model will be more comfortable if it's not too much heavier, and the improved battery life is a definite win, but it's all about the 3D effect for me. Like my fellow echidna, and many others, I'll wait til the 3rd version. Three words: Was it necessary? @BenjaminRosa: Three words: yes it was! @WolfyWardark: Completely agree with everything you said. My silver model is a classy and elegant bit if kit. Love it! Definitely an improvement, but still holding out for the next redesign. Getting mine for my birthday, upgrading from cosmos black to red. Can't wait surprised its getting good reviews. If the 3DS XL version were region free, I'd get it. On a side note, why do people insist on regarding people's views in a binary fashion of either love or hate? I hate the term 'hater'. I don't hate the 3DS XL, I quite like the look of it, but can't justify the expenditure in my current position. you have made me quite curios, what nokia battery are you talking about? I'm getting this at some point, since I doubt they'd have another revision, and my 3DS is starting to wear down due to slightly poor choices regarding screen protectors and other things. I honestly doubt there's anything they could REALISTICALLY add. I won't buy any other handheld until the next gen DS. I already hold the normal 3DS in very low regard. So this would be a little lower I suppose. 3DS XL would be awesome, but I don't have money for it. Even so, I am happy with the original one. I'd like to hear more about the DS 1:1 mode, if there's more to share. I don't really know what that means. Got a XL and I am very happy with it! Playing games like Maro Land 3D and MK7 are even more fun now. Pokémon B&W looks better on this screen then on the normal 3DS. And the sound of the XL is also better. I have the silver one, form the 20 pre orders in my game shop were almost all the silver ones. Batterylife is not better for me because on my 3DS I had a non-original battery what gave me 16 hours playtime in 2D. So I wait for another battery now. For people who are not sure what to do at the moment I only can say that ones played on the XL, you never want to go back to the original 3DS. You can do anything you can play normally, but you only get a Shy Guy and default kart. It's nice to see that this model is so well received. Personally, I am very happy with my original 3DS. I actually find the smaller screen size very cute. I was thinking of buying the 3DS XL, but I just remember of the power grip pro of NYKO. Now I can play the 3DS for 9 HOURS!!! Damn us Aussies have to wait another 22 days. I think EB games will be getting a demo unit in a couple weeks so I can work out if I need it day 1. I upgraded from my Zelda 3ds (sold it to a friend), and I have no regrets. On my first 3ds I had the occasional ghosting problem (with high contrast scenes), however, I’ve played some Zelda, Kid Icarus, Super Mario 3d land and it seems the 3d effect works much more effectively. I haven’t experienced the same degree of ghosting in the spots I use to…In some places it’s gone completely and in some places it’s just barely noticeable. Buttons do feel more clickable. And Gameboy virtual console games look great in 1:1 pixel mode. I love my red 3ds xl. As an early adopter of the 3DS, the XL upgrade would put me at $350 for the 3DS in just over a years time. As much as I'd like one, I just can't reason with that kind of cost for a system with so little coming out in the near future that I absolutely have to have. Especially considering the lack of software for both my 3DS and Vita has not one, but two very expensive handhelds in my home collecting dust. Just can't do it. The 3DS XL is a wonderfull handheld, and for me a worthwhile upgrade to play . Marvel Pinball 3D, but i totally understand those who stick with their original 3DS because all games will work fine on both. For new buyers I think the 3DS XL is a must. Gotta stand with the 3DS until it works good. For me the XL is a mixed bag. I got my XL on Friday and had the time to try a number of my 3DS games on the XL. For most games I enjoy the larger screens of course. Zelda 3D for example is very nice on the larger screen. Kid Icarus is another story. Due to the increased weight it is uncomfortable for me to hold the XL when playing the game using the stylus control scheme. In addition to that the earphone jack is too far on the left side on the XL. When I hold the console while playing Kid Icarus I always touch the earphone plug. Due to the large screen I will keep my XL. For travel and some games I will still use my old 3DS system (this is when I can manage to steal it from my wife ). @Dentyone For someone who has played video games on a small Standard Definition television his whole life, yeah - a bigger screen isn't really a big deal. And btw, where is the 2nd circle pad? Where is the 8 mega pixel cameras? ^ THOSE would have been upgrades. I don't consider making the screen bigger worthy of spending 200 dollars. Just picked mine up today. Anyone who's on the fence should go for it, it's a huge improvement. More comfortable, better location for the pen, non-telescopic stylus, better design, A LOT better buttons (god, I love these shoulder buttons), improved 3D (by a lot - for me) etc. etc. It's all just.. Better, in every way possible except the size. Though, it's as big as my 3DS was in it's case, so no problems. It's just a great package all around. Speaking of the package, the box was surprisingly small. I knew it would just be the system and some manuals, but damn. Already posted a lot about this console on other forums why I think that if you already have a 3DS this ISN'T a good buy. Its a luxury buy. The original, standard 3DS is EVEN BETTER value for money now this has come out. I got the Red+Black one of Friday,and so far I'm really impressed with it. Obviously the big screens,are the best thing about it. Metal Gear,and Kingdom Hearts look perfect on it. Only if one considers being able to see what's happening on the screen a luxury. After reading all the postive comments I'll be definetly getting one now Hope august 19th comes soon too bad i can't pick it u on release date our family reunion got moved to that day well if i dont have enough my bithday is coming u so ill be asking for it. Can you copy all your saves for your games onto it too? Like if my Zen Pinball was put on my new 3ds xl, would the save from my old 3ds still be on the new 3ds xl? Not sold to just buy it. If mine gets in bad shape or something i'll upgrade, but i love my cosmo black, i've had it since GS opened on March 27, 2011 lol. If heaven drops 200 bucks on me anytime soon I would have to repay my household money fund first for the new Medication I had to go on ........ ! CRICKIE !!!!! s I hate having to take meds instead of having a new Game System .... AH well as the Song says "WHAT A DRAG IT IS GETTING OLDER !" I remember when everyone was like LOLOL they will probably just release a 3DS XL next year after the colossal flop of the last XL. Then the second circle pad add on came out, giving rise to redesign rumors. But no, they released a larger version of the exact same design, and are charging more for that. How does that make sense? Oh, and the circle pad pro will not work with it. If you dont already own a 3ds, this is the obvious choice. But im talking about the loyal fans, the people who bought it soon after launch. I'm not buying the exact same thing again! Way to screw over your most loyal fans like you always do! I'm pretty sure I'm buying a used PS Vita today. It's too big! It's a portable, after all. what a bunch of whinners,,blah blah blah, second circle pad blah blah jagged edges blah blah cant fit in your pocket blah blah blah... get a life. Nothing wrong with my 3ds, why get a bigger one thats more expensive? I don't mind the "cons" cause there not really an issue for me. The blue 3DSXL is BEAUTIFUL, the pictures online do it NO justice. It is a deep metallic blue, it looks like my old Subaru Impreza with the racing stripes. From what I can tell, the red is pretty slick as well. I was mad about the colors at first, I wanted a black or silver, but now I am more than satisfied, having gotten my hands on one in person. The larger screen is awesome and the minor improvements like the matte finish of the casing, rounded edges, and inside/outside two-tone color scheme is perfect. I hated that the colored 3DS still had black all around the screen so they totally fixed that here. Only complaints are that the speakers are no louder than before (still sound fine with headphones though, like before) and they did not add any more system memory for storing DSiWare games, which is really a terrible shame. So I still have to shuffle my DSiWare games off and on from the SD card when I want to play specific games. In direct comparison, the original 3DS screen is noticeably brighter, but in practice and use, the 3DSXL brightness is just fine and you'll forget about the difference instantly. I like that they moved the headphone jack to the left side instead of having it centered. The larger size provides a more comfortable layout for the analog and d-pad. The system feels quite thin compared to the original. DS games look WAY better on the XL than they did on the 3DS, on the original they seemed all fuzzy, here they look great to me. The system transfer was easy enough but took at least 45 minutes (you have to do a firmware update on the XL before you can start too). Gamestop sadly has no plan in place for allowing you to trade in your old 3DS to get an XL and be able to do the system transfer. They also don't have an internet connection in their store, which is ludicrous and there is no way to do a system transfer without the internet. But with some convincing and help from some very nice sales associates, I got it worked out. You guys in UK are lucky that GAME lets you take the unit home and bring the old one back the next day and still get credit.